Russian Foreign Ministry announced that Russia will continue evacuation of its citizens from war-torn Yemen. MOSCOW (Sputnik) – Russia will continue evacuation of its citizens from war-torn Yemen, Russian Foreign Ministry announced in a statement Sunday. "The Russian Federation will continue to take measures to guarantee security for Russians staying in Yemen, including the evacuation from this country," the statement said. 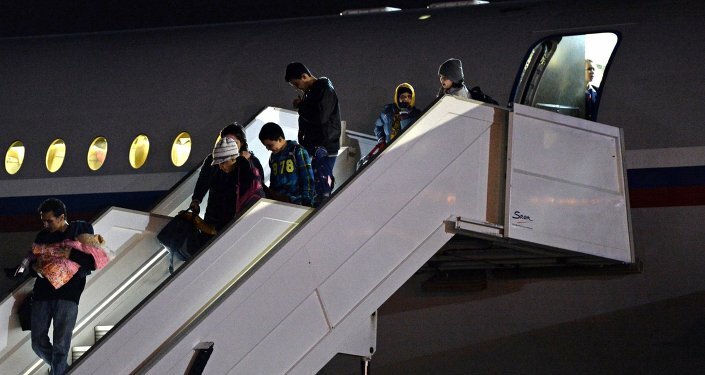 The Ministry added that 67 Russians and 245 citizens of other countries, including those from Belarus, Ukraine, Cuba, Egypt, Syria and Yemen are already evacuated. The evacuation was conducted in cooperation with the authorities of Saudi Arabia, Egypt, and Yemen. Russia have evacuated about 600 people, mostly women and children, from Yemen over the past few days. At the end of March, Saudi Arabia launched military operations against the Houthi militants, who currently control large parts of Yemen, including Sanaa. Bahrain, Qatar and Egypt are the states that joined the Saudi-led coalition. The military campaign came as a response to a request from Yemen President Abd Rabbuh Mansur Hadi, who fled the country. About 519 people, including 90 children, have been killed and about 1,700 wounded in Yemen in the past two weeks, UN humanitarian chief Valerie Amos said Friday.